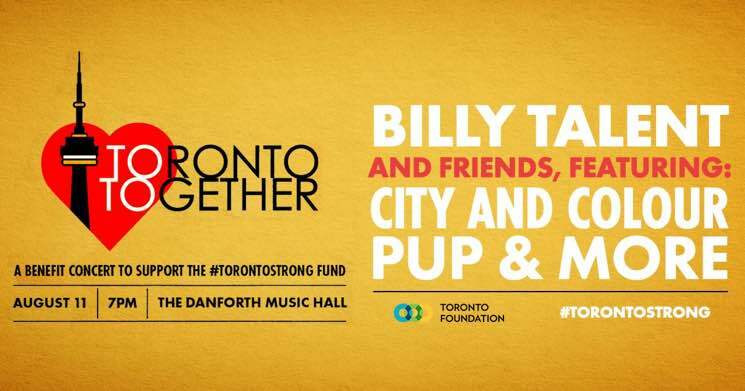 Billy Talent, City and Colour and PUP will perform at a benefit concert for the recent Danforth shooting in Toronto. Dubbed "Toronto Together," the event will take place at the Danforth Music Hall on August 11, in the midst of the annual Taste of the Danforth street festival. Tickets for the show go on sale tomorrow (August 1) at 10 a.m. EDT. All proceeds will go to the #TorontoStrong fund. Billy Talent frontman Ben Kowalewicz told CP24 that the concert was his way of celebrating the victims of the mass shooting. "We want to let them know that we love them," he said. A gunman opened fire on Danforth Avenue on the night of July 22, killing an 18-year-old woman and a 10-year-old girl, in addition to injuring 13 other people.